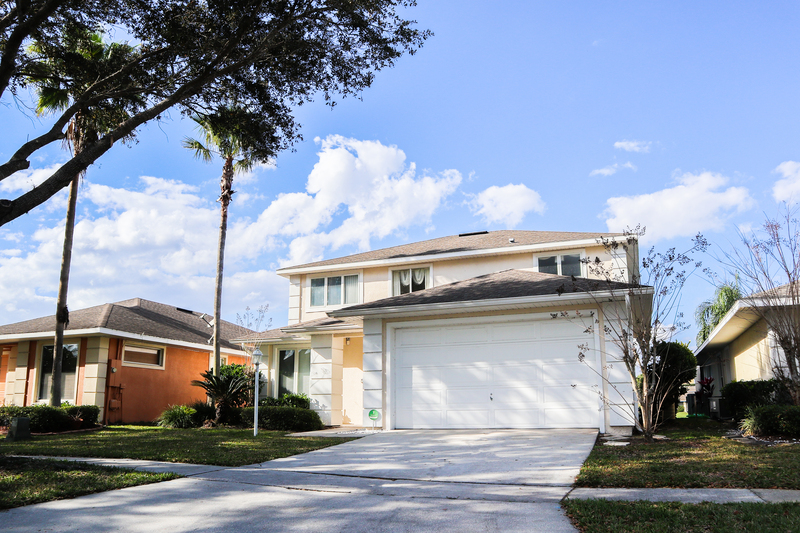 As you approach Villa HunnyPot you’ll find yourself on a quiet street in the peaceful and secure gated community of Sunset Lakes. Our private driveway provides shaded parking for two cars. Sunset Lakes offers guests a communal pool, children’s playground, fishing (no permit needed) and a scenic lakeside dock. 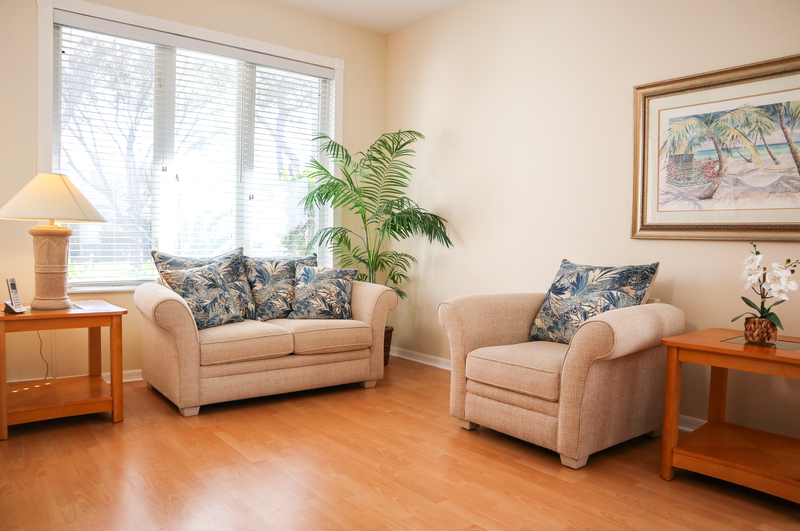 Our tranquil community is just minutes from a main highway with it’s many restaurants, shops and of course, Disney! 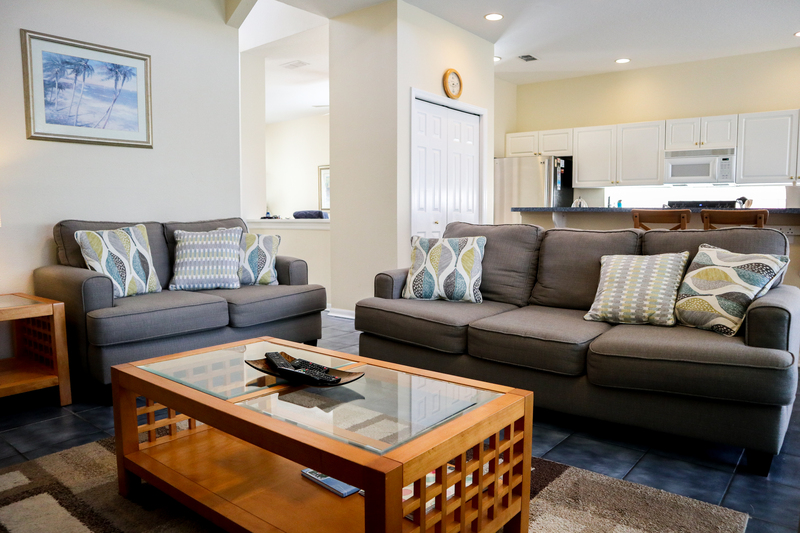 The family room has high vaulted ceilings and large patio doors opening onto the outdoor dining area and pool deck making the room light and spacious. This space is at the heart of the villa and is equipped with digital TV, bluetooth sound bar, DVD player and a range of DVDs for all ages. 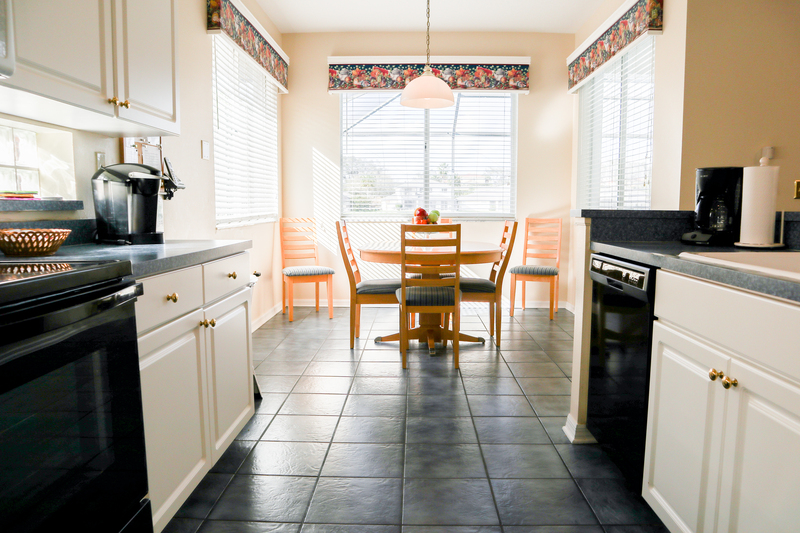 The kitchen is well equipped with a wide range of appliances, including an oven, microwave oven, dishwasher, coffee maker and large fridge/freezer. There is an adjoining nook for informal dining overlooking the pool. With an open plan layout, the kitchen and family room are separated by a breakfast bar – making it a very sociable area. The pool area allows you to enjoy year round sun. It is 30x14ft at a depth of 3-6ft – enough for some gentle lengths and plenty of pool games. 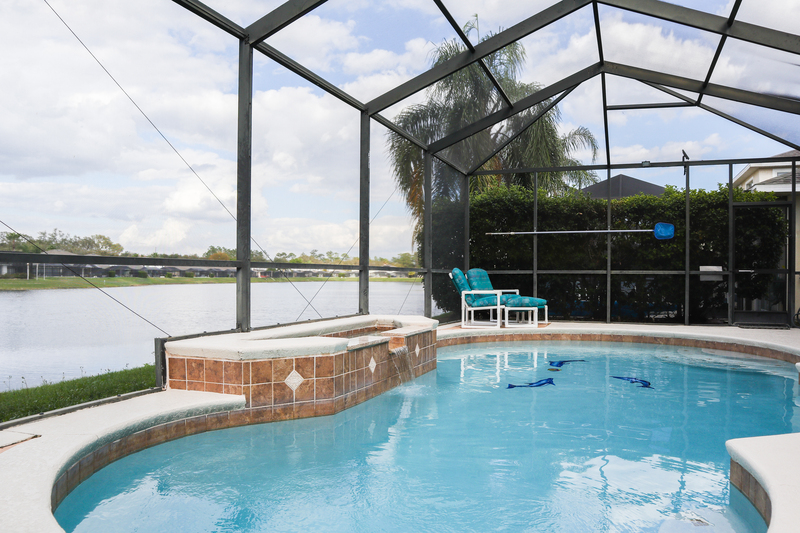 In the summer months the pool area enjoys the sun for more than 80% of the day, but there is also a covered lanai, should the sun become too hot! Hedging along the sides affords extra privacy from neighbouring villas, and the uninterrupted view over the lake means you won’t be overlooked when you’re outside. Comfortable, reclining chairs surround the pool so you can relax in style. The pool can be heated during the cooler months (a charge is made for this). 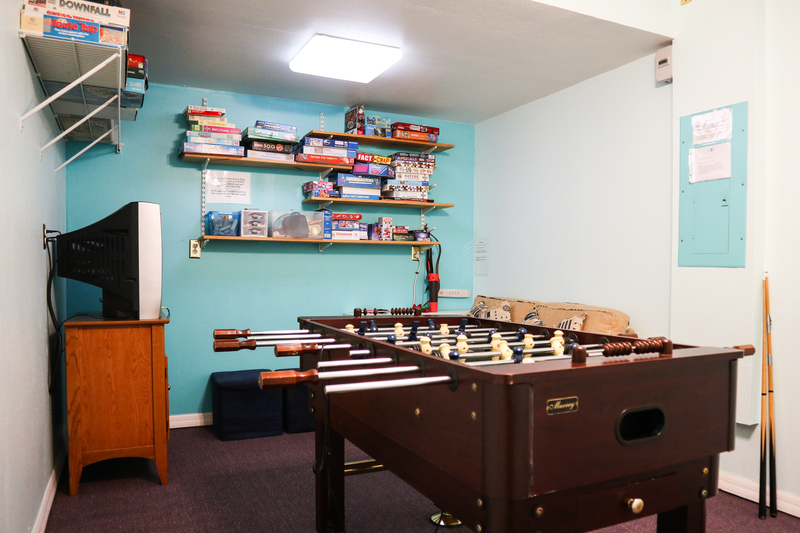 The games room is equipped with a 10 in 1 games table (including air hockey, fussball, table tennis, pool and more), a PS2 with games, an extensive selection of board games, jigsaws and an ever growing ‘library’ of books to read in the sunshine – with something for everyone, young or old! At the front of the villa is a more formal dining area with seating for four and an additional seating area with a sofa and armchair, providing the perfect retreat for a quiet moment to yourself. Manage your Booking - Coming Soon!